Souverain was in many ways a lot of great things and a lot of things I wished had been done better. It was as the book is itself about, a conflict. 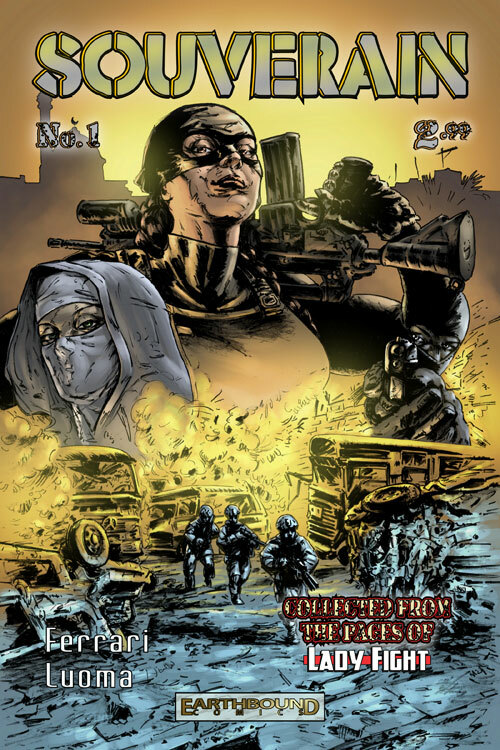 Soverain is the story of an American woman stationed in Afganistan where although she is not allowed to fight on the front lines, she finds her own way to do it as a masked vigilante named Souverain. I love the concept and heart of this concept, the art is skillful and presents the story well but it was in the actual writing of the book where I felt that things fell apart. Willing to touch topics that very few are currently touching – certainly not in The Big Two, Souverain in its own way talks about American ideas of equality between the sexes where women are not allowed to fight the front lines The title has a strong female lead that is never sexualized or looked down upon for what she is. And the writing begins to explore what it means to be fighting a war where the soldiers cannot allow their own moral beliefs to get in their way. Souverain has a classic sense both in the willingness to deal with political and other hot topics that are not just social selling points but it also feels like the book is written with a classic sensibility that leads to an at time overwhelming feeling of being told things and not learning about them as they occur in the character’s life. The writing of Soverain seems to not have learned from the modern comics’ use of intimate moments to allow the reader a deeper sense of the protagonist’s actions rather than a list of the great deeds they have accomplished. The writers of Soverain should be discussing the specific details of what leads to the actions the lead character takes rather than just displaying these actions that the reader is to take for granted as good and the right thing to do. There are pieces of this book that lead me to believe that the writers are capable but it ultimately it falls short, even with this incredible concept and art. This entry was posted in Columns and tagged afganistan, Ben Ferrari, Chuck Michael Obach, earthbound comics, Kitae Kim, Matt Grant, Mike Luoma, Seth Frail, souverain, Vic Moya. Bookmark the permalink. Follow any comments here with the RSS feed for this post. Post a comment or leave a trackback: Trackback URL.